Last night marked the debut of Uncontrolled Vocabulary, a new online library-esque talk show put together by my man Greg Schwartz. Greg and other awesome folks discussed some happening library issues and cracked a few jokes too. Check out this post for a recap of the first episode. And the show notes are available as well. I was on of the folks listening in and participating via Twitter since I got in late and realized I didn't have the TalkShoe software installed on my laptop. It was crazy fun though and I hope to join in at some point once I get settled in Chicago. I know Greg has had this idea percolating for a while and it was great to hear it come to life. And see him back online contributing to the library world. Excellent job. Yesterday David King proposed that the BIGWIG Social Software Showcase was the most attended program at ALA 2007, counting both the in person groups of 30 or so and the online audience. Cuz you didn't have to be physically there. As I'm not really doing anything but mapping directions to Target and IKEA in Chicago, I decided to add up all of the presentation page views from the wiki, plus the number of folks who watched the Twitter screencasts. I don't have the numbers for any of the other interactive content. I haven't seen actual numbers of physical attendees for ALA, but let's assume that it is around 20,000. So that's about a THIRD of the people who came to DC. Of course people probably watched multiple presentations, but still. That's pretty awesome. And since the material is available online the number is only going to go up. With my new job started paying a little more attention to publishing issues, especially related to magazine publishing. A couple of related recent stories caught my attention and bring up some interesting financial issues in small press or indie publishing. McSweeney's, one of my favorite publishers, is having financial difficulties due to a bankruptcy filing by their distributor. The are (or were in early June) auctioning off some rarities and inventory and giving subscription discounts to try to raise a big enough chunk of cash to keep operating. They've lost around $130,000 in earnings due to the bankruptcy. Financial problems with a distributor also caused long running zine Punk Planet to stop publishing in the last week or so. It is pretty much the same story, they signed with a distributor who ended up not paying them and is now (I think) in bankruptcy. There was a great interview with Punk Planet founder Dan Sinker in Chicago Public Radio when I was there last week. Aside from a few ego moments (I can think of several people who would argue that Punk Planet wasn't THE arbiter of indie/ punk culture over the past decade or so), the interview gives a fascinating look at the work of economics of indie and small press publishing and distribution. Other publications, including Utne Reader, apparently worked with the same distributor and are fighting as well. Both of these cases illustrate the tightrope walk that has to take place for many small publishers, especially literary mags and zines in general. It looks like there is a point when success can cause a need for outside, or more mainstream, distribution which takes some parts of the process out of the hands of the folks who are involved with the publication on a daily basis. And have to handle business issues for multiple publications. The same sort of growing pains that can effect indie record labels that have one or two break out acts. In the words of a great philosopher: mo' money, mo' problems. Here's a funny Onion Infographic on the iPhone. Should I buy an iPhone? Treo? Regular cell phone? Tin can w/ string? 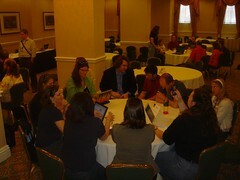 Thanks to everyone who came to the BIGWIG Social Software Showcase roundtable on Saturday. The organizers went out on a huge limb to put together the program and I'm sure appreciate you too. We had a great conversation at the Twitter Table. The session went much longer than the scheduled hour and there was great conversation and debate at other tables too. And there was much live tweeting going on. The music before the session was by Jorge Ben Jor. Make sure to take a look at the BIGWIG Social Software Showcase wiki and check out all the great presentations. That's the great thing about an online conference. You don't have to be there to learn something. Thanks to everyone who came to the RUSA/ MARS Reinvented Reference Pre-Conference on Friday. I had a blast talking to you. And listening to all the other awesome speakers. It was a great day. The music I played before my talk was by Pink Floyd. You may have heard of them. Links to my slides, podcasts I talked about, info on how to create podcasts, and more are available on my presentation wiki. Will I have to spend extra time in purgatory for buying a Starbucks while listening to Fugazi on my mp3 player? Leave a comment! 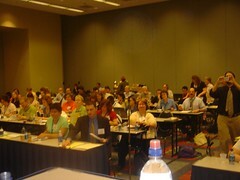 Thanks to everyone who came to the RUSA Reinvented Reference III preconference at ALA Annual 2007. Here are links to the library podcasts I featured in my talk. I'll post my slides and some other information a bit later today. Please let me know if you have any questions. Thanks again for coming! Librarian 2.0 is a trendspotter. Libs should: Evolve/ let go of control/ be visible in person and online. Rethink physical reference space. Go beyond ref bunker. Don't ban technology because it is technology. Have sane policies. Be transparent. Open human conversation. Speak in a human voice. Catalog as blog - Plymouth State University: patron comments, let's patrons become engaged. Plan with your users. Listen to your users. Hennepin County hacked catalog to allow comments. Bookspace. Go where the users are. Have presence in the lives of your users. Text/ SMS notifications in future. Good option for reference. Give staff a sandbox to play with new tools before launching. Make it fun! Post cool pics etc. Doesn't have to be work related to learn. Blog your library meetings. McMaster emerging technologies group. Learn from gamers. It's OK to make mistakes and back up if you need to and regroup. Second Life reference questions are growing. 200/ week! Build library renovation projects in Second Life first and let users take a look and comment. Create a culture of trust. Trust staff. Trust users. Library 2.0 Squidoo and Ning sites. Let the travelling begin! On Sunday I'm heading up to Chicago for four days to look for a place to live. I've got some good leads thanks to the Chicago Reader and excellent assistance from friends and aquaintances. But wish me luck. Then on Thursday I fly to DC for ALA Annual. My schedule mainly consists of my participation in the RUSA Reinvented Reference preconference, BIGWIG Social Software Showcase roundtable (Saturday from 1:30-2:30, Renaissance Mayflower Cabinet Room) and lots of ACRL job related meetings. With some social opportunities and a couple of actual sessions thrown in. I am free pretty much all Monday morning before I fly back to Atlanta at 4pm, so drop me a line if you want to get coffee or lunch or can recommend a good session. I'm skeptical of my Internet access in Chicago hotel, but will be online daily from someplace with free wifi. So keep the Twitter comments coming. I'm going to try to blog from Annual as well if I can get online. I again can't figure out access possibilities at hotel, so posts might be pretty few and far between. Questions, comments, and apartment leads are still being accepted at dwfree(at)gmail(dot)com. Hope to run into some of you in DC. If you see me, say hello. Back in April at Computers In Libraries I was asked by my friends Michelle, Karen and Jason to participate in something they were planning for ALA Annual through the LITA BIGWIG group called Super Secret Project #2. SSP #2 is now known as the BIGWIG Social Software Showcase. It is an online "unconference" happening at the same time as Annual with 11 presentations on up to the minute, cutting edge technology topics. The kinds of things that the realities of planning a huge, major conference like Annual make very difficult to cover. I was glad to contribute as all three of them are good friends and very, very innovative and cool librarians. I knew a couple of the people who were doing talks, but had no idea I would end up on a program with Michael Casey, Karen Schneider, Jessamyn West, Tim Spalding and all the other amazing folks. My talk is a screencast called "Welcome To The Twitterverse". It is an introduction to Twitter and how libraries and librarians are using the service. My PIC David Lee King contributed the second part of our Twit-O-Rama called "i r fluffin yr twitterz", which covers cool Twitter applications and mash-ups like Twitbin. I'm not 100% sure that's a compliment, but I'll take it as Peter Buck was my hero when I was in high school in Athens in the mid-80s. Visit the BIGWIG wiki site and see for yourself. And make sure to watch all of the other presentations as they come online over the next week. Both David King and myself should be at the Social Software Showcase roundtable discussion at Annual to talk Twitter. It is being held on Saturday, June 23 from 1:30-2:30pm in the Renaissance Mayflower Cabinet Room. Come by and chat with us. What do you think? Is Twitter a good tool for libraries and librarians? Watch the presentation and leave a comment on this post. Or just leave a comment and discuss all matters Twit. Podcasting is an emerging technology that allows for the easy online distribution of media files. The use of podcasts for both personal broadcasting and as a media tool has grown greatly in the past couple of years. Many institutions of higher education are now utilizing this technology as a method of distributing promotional and educational content. This webcast explores the growing usage of podcasting in higher education and examines how academic libraries fit into the educasting environment. The session focuses attention on examples of podcasts as classroom and library instruction tools and examines how academic libraries can become more integrally involved in podcasting efforts on their campuses. This Webcast will last approximately an hour and a half. You can register on the ACRL site. And yes, there is a reasonable registration fee for the session. Again, please don't yell at me for doing something not free. You may be thinking "Isn't he moving to Chicago around then? Is this guy crazy?" And the answer would be yes. And yes. The presenter bio is slightly misleading as I will technically be unemployed at the time. But the webcast will be fun and informative. And I promise there will be clips this time. I'm currently working on moving my work podcasts to a free hosting site for archiving before I leave at the end of the month. I again really wanted to support OurMedia and Internet Archive by using them for hosting. It's been months and months since I tried to upload to OurMedia and figured that the upload times might be better now. Not the case. After fighting through several attempts to upload a file and getting either impossibly slow response times or my login not recognized, I gave up and went back to my old friend blip.tv. I've already gotten several files uploaded in a fraction of the time it took me to fight with OurMedia. So hats off to blip.tv for making one small part of my current insanity easier. And for easy video hosting too. If you happen to be using any of the presentation materials located on my GPC website (as opposed to my wiki), download what you are using or may want to use in the future prior to June 29th. That web space is going to disappear when I leave GPC. I am going to transfer materials from conference presentations to my wiki and SlideShare at some point, but it will most likely be after I get to Chicago. The archive from my SirsiDynix Institute presentation on Tuesday is now available. I would watch the two presentation Greg Schwartz did last year first and then mine to get a pretty up to date picture of the podcasting world. Greg gives a bunch of great technical information in his talks. Sorry for the lack of non-presentation related blogging lately. I have been incredibly busy with said presentations and work. Another reason for lack of said blogging is that I've been involved in interviewing for a new job. I'm leaving my current position here at Georgia Perimeter at the end of June, moving to Chicago, and starting work at ACRL as editor of College and Research Libraries News (along with some marketing and PR work) in the middle of July. Moving from the academic world to the association and publishing setting is going to be pretty huge, but also exciting. I have a graduate degree in English along with my MLIS and had considered working in editing/ publishing in the past. So now I'm going to get to combine both areas of interest in one position. I also hope to be able to do some new things with the online version of C&RL News. I'm not sure what or how quickly anything will change, but I think it is on the radar. I'm going to also use the move and new job to greatly reduce the amount of speaking I've been doing. I'm getting somewhat burned out on talking about podcasting and really think the topic, or at least me talking about it, is reaching saturation. I'm sure I'll do a few talks here and there, maybe about other things, but after fulfilling the commitments I have the rest of the year it will greatly diminish. I don't foresee much changing with my blog though. I don't really talk about my work much outside of specific projects, so I expect that to continue. And do more writing about general library topics and other random things. The podcasting content will continue too as I'm still very interested in creating podcasts and keeping up with the technology. Although posts may be pretty spotty and involve ALA Annual and complaining about travelling for the next month or so! Here are the links to the podcasting news and information sites I mentioned during my SDI talk today. They all have great information about producing and comsuming podcasts. Here are links to podcasts I talked about during my SirsiDynix Institute webcast on June 5th. Links to podcasting tools and library podcasting resources are available on my wiki. Blog post with more podcasts consumed by real, live librarians!